The second law of thermodynamics surely qualifies as one of the most talked-about principles in all of physics. Depending on who you ask, it is either incredibly mysterious or fairly mundane. Some physicists think the second law is connected to fundamental ideas such as time and the origin of the universe,1 yet it is also an aspect of everyday experiences, such as how a morning cup of coffee cools down, or the fact that you cannot unscramble an egg. The second law has even been invoked by rock band Muse to explain why, in their view, economic growth cannot continue for much longer.2 However, trying to find a clear explanation of what the second law actually is (and why it is true) can be a frustrating experience. I first encountered the second law as a teenager, while reading an issue of the fundamentalist Christian magazine Creation, given to me by my grandmother. Since the article’s author wanted to argue against biological evolution, it claimed that the second law of thermodynamics implies evolution is impossible. Its definition of the second law was that disorder always increases with time. At first glance, this does seem incompatible with evolution by natural selection, which can lead to more complex, “better designed” organisms over time.3 At the time, I thought it was unlikely that mainstream biology would flagrantly contradict mainstream physics, so I remained sceptical of this argument, even though I couldn’t understand the counterarguments I found on the Internet at the time. During my first university physics course, I was excited when I learned we’d be studying thermodynamics. Finally, I thought, I would be able to understand the second law properly (along with the other, less popular laws). Alas, my expectations were not met, despite having a good lecturer. Instead of discussing big-picture issues like evolution, economics, or cosmology, we worked out the maximum possible efficiency of refrigerators and steam engines. I’m sure these are interesting in their own ways, but I was disappointed. The version of the second law we studied was related to concepts of heat and temperature, and little else. A familiar consequence of this version of the second law is that heat always flows from a hot object to a cooler one, and not the other way around. 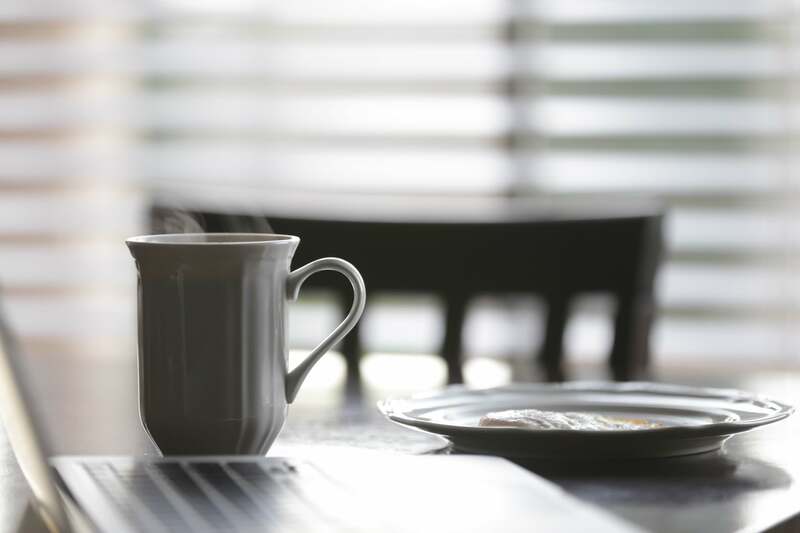 Your morning cup of coffee cools down, and heats up the air around it; it doesn’t heat up further while cooling the room, even though that possibility is compatible with other laws of physics such as the conservation of energy. The second law is formalised by defining a quantity called entropy. When heat flows out of one object and into another, the first object’s entropy goes down, by an amount that depends on its temperature. The change in the entropy is the amount of heat energy transferred, Q (usually measured in joules), divided by the temperature of the object, T1, measured in Kelvin. When that same heat energy flows into another object, that object’s entropy goes up by Q divided by the temperature of the second object, T2. The second law of thermodynamics can then be stated as, if you add up all of the changes in entropy of all the objects you are studying, the result must be a positive number or zero. It can’t be negative. In other words, the total entropy must either increase or stay the same. When a cup of coffee cools down its entropy decreases, but the entropy of its surroundings increases by an even greater amount, since the coffee is hotter than the surroundings. The version of the second law I just described, usually attributed to the 19th century German physicist Rudolf Clausius, certainly has its uses. However, it is a far cry from the lofty fundamental principle I had expected to learn. What did it have to do with evolution? The illusion that organisms are well-designed doesn’t have anything to do with heat being transferred. It doesn’t have much to do with the economy either, except very indirectly, because machines are useful and the second law prohibits certain kinds of machines. In the animation, purple gas atoms start above the horizontal barrier in the middle of the box, and green atoms start below the barrier. As time progresses, the purple and green atoms end up spread throughout the entire box. This “spreading out”, in a physical sense, was claimed to be an example of the second law, yet I could never find what heat was being transferred in this example. If no heat is being transferred, the Clausius second law doesn’t apply; we are left with hand waving about disorder. So is there a version of the second law that relates to concepts more general than heat and temperature? It turns out the answer is yes, but I had to wait many years before I learned it. Surprisingly, it turns out this more general second law isn’t really a principle of physics, but rather a principle of reasoning. This more general version of the second law not only explains why the Clausius version is true, but gives us a tool for much more general questions, like the evolution question or Muse’s economic musings. It also appears in everyday life, and not just in situations involving heat and temperature. For example, why is darts difficult? Why can’t most men sing operatic high Cs? And why are political polls (somewhat) accurate? During my PhD studies, I became intensely interested in Bayesian statistics4 and how to use it in astronomical data analysis. During this process, I discovered the work of heterodox physicist E. T. Jaynes (1922–1998),5 whose clear-headed thinking and combative writing style changed the direction of my PhD project and my life. One day I came across a particular Jaynes paper, which is now one of my favourite journal articles of all time.6 I didn’t understand it immediately, but had a strong sense that I should persist because it seemed important. Every so often, I’d return to re-read it, understanding just a little more each time. The breakthrough came after dinner one night. Now I tell you that one of the books on the shelf was signed by the author. Which one? I’m not telling. Based solely on this information, it makes sense for you assign a probability of 1/52 to each of the books, describing how plausible you think it is for each book to be the signed one. From this state of near-ignorance, it seems like you might not be able to draw any conclusions with a high confidence. But that’s an illusion; it depends on what questions you ask. Imagine if I were to ask you whether the signed book is a non-fiction book. If your probability is 1/52 for each book being the signed one, the probability the signed one is non-fiction must be 50/52 (adding the probabilities of the 50 non-fiction books together), or approximately 96%. That’s an impressive level of confidence — much more than you should have in the conclusion of a single peer-reviewed science paper! Of course, a high probability doesn’t mean the expected result is guaranteed. It just means it’s very plausible based on the information that you explicitly put into the calculation. Here is a (very simple) diagram of my bookshelf, with the blue regions being non-fiction books, and the red being fiction: Clearly the safest bet is that the signed book is non-fiction, simply because there are more of them—they occupy a large majority of the volume of possibilities (which, in this case, corresponds to a physical volume on my bookshelf). The general principle here, which Jaynes pointed out, is this: If you consider all possibilities that are consistent with the information you have, and the vast majority of those possibilities imply a certain outcome, then that outcome is very plausible. This is also a consequence of probability theory. The only way around this conclusion is to have some reason to assign highly non-uniform probabilities to the possibilities. For example, if I had some reason to think fiction books were more likely to be signed, I wouldn’t have assigned an equal probability of 1/52 to each book. The Jaynes version of the second law (about uncertainty) can be applied to all sorts of questions, and it can also explain why the Clausius version (about heat and temperature) is true. When I say that I have a hot cup of coffee and that the air around it is cooler, it seems like quite a specific statement. But in a certain sense it is actually a very vague statement, in that it leaves out a large number of details about what’s actually happening. I didn’t tell you the colour of the mug, whether my window was open, whether the coffee was instant or not (usually instant with soy milk and two pills of sucralose if you’re wondering…I can handle the hate mail). More importantly, I also left out key details about the position and velocity (speed and direction of movement) of every molecule in the mug and the surrounding air. The high temperature of the coffee means its molecules are moving fairly rapidly, but there’s precious little information apart from that. Based on this very vague information about the cup of coffee, can we predict what will happen in the future? Our common sense and experience say yes, very loudly. Hot cups of coffee cool down. Duh! But to a physicist the standard way of predicting the future is to use the laws of motion, which predict how particles (such as molecules of coffee and air) will move around. The catch is that we need to give the initial conditions: what are all the positions and velocities that we’re making our prediction from? Now, what the laws of motion will do for you is tell you how a point in this diagram will move around over time (equivalently, how the positions and velocities of all the molecules will change over time). At a particular instant, the physical reality is represented by a single point somewhere in the red zone. As time goes on, that point will move around (as depicted by the curved arrow in the diagram). Where will it end up? That depends on precisely where in the red zone the point was initially. However, a special property of the laws of motion is that if your uncertainty about the initial point is represented by the red zone, then your uncertainty about where that point ends up will be represented by a region of the same volume. In physics, zones of uncertainty are like containers of ice cream; they can’t be compressed. Notice that the red zone is much smaller than the green zone, representing the set of possibilities compatible with the vague statement, “The coffee is cool and the surroundings are slightly warmer (than they would be in the red zone)”. Therefore, if the red zone is moved around and changes in shape (but retains its volume), it’s possible for it to fit entirely within the green zone, simply because it’s smaller. On the diagram it’s about 20 times the area or so, but in physics it can be bigger by a factor of something like 10^(10^20). Therefore, the following rule of thumb is at least possible: if the starting position is in the red zone, the final position will be in the green zone. The opposite situation doesn’t work. Instead, we have to admit that if the starting position is in the green zone, the final position will almost certainly not be in the red zone. Translated back into statements about coffee, ‘hot cups of coffee tend to cool down’ is a reasonable rule of thumb, but ‘cold cups of coffee in cool rooms tend to heat up’ is not, and this is all due to the volumes of the red and green regions in the set of possibilities. There is a freaky subset of states within the green zone which would lead back to a hot coffee. But its volume is absurdly tiny that we could never hope to engineer a coffee/air system that’s actually in that subset. Thus, the idea of making a plausible guess based on your incomplete information explains why the thermodynamic ‘heat and temperature’ version of the second law is true. In fact, the connection is so close that Clausius’s definition of entropy corresponds exactly to the size of the regions of uncertainty. Interestingly, this explanation doesn’t really explain anything about time, since notions of time were assumed in the explanation itself. Presumably, a more fundamental explanation for time would explain it in terms of some other concepts. Many physicists will happily talk about “the entropy of the universe” being low in the past, or how Stephen Hawking derived the formula for “the entropy of a black hole”. These are probably correct and interesting results (I am not very familiar with all the details of them), but I have a nit to pick. Entropy is too subtle a concept to be taken for granted. Since the exact same physical system can have more than one entropy (depending on how we want to think about it), we should be totally explicit about how we are defining and using it. In terms of the previous diagram, entropy is not a property of the arrow (which describes what actually happened) but a property of the red and green regions (describing uncertainty). Entropy describes what is known about a system, or how much information a vague statement provides (or would provide) about the system. There is no ‘true’ entropy that we could calculate even if we knew everything there was to be known! What rules of thumb are we looking for? Different ones may exist, and we’ll find them by using different entropies. It all depends on what specific vague statements we are interested in. For example, we might want to see whether hot coffee tends to cool down, and in this case entropy will involve heat and temperature, or we might be interested in whether gas in one half of a box will tend to mix with the gas in the other half of the box (like in the animated gif). In that case, the entropy will have nothing to do with heat transfer, but rather how much of each type of gas is on either side of the barrier. When people first hear that a “law of physics” can be derived as a prediction based on near-ignorance, their natural inclination is to worry that a prediction based on near-ignorance might be wrong. Of course it’s possible. However, when this occurs, it’s a good opportunity to learn. If 99.99999999999% of the possibilities would imply one outcome, and that outcome does not occur, you need to figure out why, and in doing so, you might discover something new. It’s worth thinking about whether the second law really does forbid evolution by natural selection. We don’t need to get particularly technical with the concept of entropy in order to have a go at that. All we need to ask is whether it’s plausible that a population of self-replicating organisms will tend to improve their survival and reproductive fitness over time. The answer is yes, provided the mutation rate is sufficiently low. And if the organisms reproduce sexually, the population’s average fitness will increase even faster.8 This isn’t the Clausius version of the second law, but an example of the Jaynes one: of all the possible deaths, reproduction events, and mutations that could plausibly occur, most would lead to an increase in the average fitness of the population. The probability that a populations’ fitness would decrease is low because, for that to happen, the organisms with worse genomes would have to be reproducing more than the ones with better genomes. I’m not an economist, so I don’t know whether Muse are right about the economic consequences of the second law. The economic mainstream seems to think continued economic growth is plausible and desirable. Some dissenters exist, and occasionally they seem (to my uneducated mind) to have some good points, although some others just seem to be Malthusians with a desire to take up gardening. The probabilistic reasoning underlying the second law is also applicable to other fields. I like to apply it to singing, which is one of my favourite hobbies. About ten years ago, I decided to learn how to sing, since it seemed fun, and not having to carry an instrument around has its advantages. Back then I couldn’t sing very well and in particular I couldn’t sing above E4, the E just above middle C. This was frustrating but very common. Most men can’t sing along with high songs unless they transpose the melody down by an octave. It turns out that singing high notes requires very specific conditions to be achieved in the larynx, regarding air pressure and so on. To get this right, you need to apply muscular effort in your torso in a particular way that singers traditionally call support.9 You also can’t be quiet unless you want a very gentle “falsetto” sound. The volume required is more than most people would intuitively feel is necessary. For example, I can’t (attempt to) sing high-pitched rock songs while my wife is in the same room because it hurts her ears (because it’s loud; regardless whether it’s good or bad…). Your choice of vowels is also more restricted than at low pitches. All these specific conditions (loud volume, correct support, a vowel that works) must be met in order to sing a high note. And the reason it’s hard is the same reason it’s hard to hit a hole-in-one, or carry out any precise physical feat; of all the things we could do, most of them don’t lead to a successful good-sounding note (or an accurate golf shot). If (almost) all roads lead to Rome, it’s a good bet you’ll end up in Rome. The second law of thermodynamics is as simple as that. Understanding its logic, and how it arises from uncertain reasoning (essentially little more than probability theory), is the key to extending its use outside of physics in a sensible way. Dawkins, Richard. The blind watchmaker: Why the evidence of evolution reveals a universe without design. WW Norton & Company, 1986. Sadolin, Cathrine, Complete Vocal Technique, Copenhagen 2012. ISBN 978-87-992436-7-9. I enjoyed reading this execellent article but leave with the impression that the part w.r.t. evolution had a logical issue concerning the notion of fitness, which I think is defined as reproductiive success. I am not an expert in this field though. That’s definitely possible, as I’m not an expert either, and I could have used the terms slightly incorrectly. However the main point is whether something is plausible. If you have good reasons for plausibility, there isn’t anything ‘extra’ you can get by considering the second law. “Fitness” is often quantified as the number of viable offspring an organism leaves in future generations (Dawkins would probably reduce it to genes – he sees organisms as DNA’s “devices” to ensure its survival). Hence it’s almost a circular argument to say that “a population of self-replicating organisms will tend to improve their survival and reproductive fitness over time.” (not trivial, but true by definition). I had always got around the argument that life violated the 2nd law by pointing out that the 2nd law applies to a closed system and an organism (or even a biosphere) is not a closed system. Living things decrease their entropy but do so by spreading a larger value of entropy into their surroundings (I know I spread entropy around liberally wherever I go!). This is great. Nice to find someone who also sees things through the entropy lens. I personally couldn’t make any sense of statistics or much of physics (Copenhagen!) until I started reading Jaynes. If you just skim the abstract, I think it’ll come across how subtle this business can be. Absolute fitness, in terms of offspring number of probability of survival, does not necessarily increase in time, because of frequency dependence. Organisms can definitely select themselves into extinction, for example, because of negative externalities of behavior. But measured as relative numbers or survival at each moment in time, then yes. This is a superb explanation, Brendon. I felt I had a reasonable handle on the probabalistic nature of the 2nd law but the representation of the probabilities as areas is a very useful conceptual tool. Also, the fact that a single system can have different entropies had me thinking about the minimum entropy of any particular system. That would seem to me to be determined by the HUP (without any uncertainty, it would theoretically be possible to know the exact position and momentum of every element in the system, which seems to imply an entropy of zero). Is there a way of calculating the minimum entropy possible in any specified system (It would seem to me to involve Planck’s constant and Avogadro’s number which would quantify the number of elements and the uncertainty about each of the elements’ properties)? I learned that there is quantity called “multiplicity” corresponding to the number of possible states of a system. The most probable state is related to the entropy and involving “large numbers” and “very large numbers.” Mathematically, the most probable shape of the Earth is a perfectly smooth surface – but that’s not right – the most probable shape in terms of multiplicity is a even distribution of the atoms making up the Earth over the volume of the universe – but that’s not right either – the most probable state is a energy equivalent of all the mass of the Earth distributed at near absolute zero temperature over that volume. The second law does not seem to say anything about why the Earth (or any thing) is not, even in the long run, in it’s most probable state. That’s a mystery to me. Isn’t the answer gravity? In the long run, the earth will disappear and its atoms will be disbursed in space. But in the short run, gravity wins out over entropy and brings complexity instead of simplicity. In that sense, gravity is a creative force. Good article. I especially like the Muse reference. Who would have thought “The 2nd Law” would be the name of a popular rock album? Seems a clash of cultures. I’m not convinced by your explanation of evolution and the second law of thermodynamics. I think there is a fundamental conflict between the modern synthesis of evolution (evolution = random mutation + natural selection + inheritance) and the concept of entropy. Entropy increases because among all choices the disordered choices dominate. So when random choices are made, the results will be disproportionately disordered and order will decrease (and entropy increase). Evolution requires that order increases, in that organisms become more complex. The theory is that by chance an occasional mutation will be favorable, and that mutation will be selected naturally and propagate throughout the population. Natural selection acts like a ratchet, ratcheting up complexity. But that argument doesn’t work. As an organism became more complex, the chances of a favorable mutation would become minuscule. And natural selection can only work on one trait at a time. It’s too crude an instrument to craft complexity. Something else must be going on. Life is a constant fight against entropy. If there were not some creative force to counteract entropy, life would be fragile. If a building is not maintained at some cost, it deteriorates and disappears. Life should too. But life is not fragile, it’s fecund. Our world is full of life. At some point in our earth’s history life sprung out of non-life, and it has become unbelievably complex. So the question for evolution is, where do the favorable variations come from? It can’t be random. The law of entropy forbids that. So how did life go from the simple to the complex. I don’t believe in God, but at least that’s an answer. Modern evolutionary theory doesn’t have an answer, and seems not even to understand the question. Evolution is not in conflict with the increase of entropy overall. Thanks for your reply. I agree with you that evolution does not violate the second law of thermodynamics. Your explanation on that is a good one. Natural selection cannot explain how this happened with biology, as natural selection is not a creative force. It simply selects between existing variations the one that is more favorable. But what created the more favorable variation? Random chance cannot be the answer, because random chance will produce many more unfavorable variations than favorable ones, and that ratio will be (effectively) 100% as the thing becomes more complex. Indeed, some have thrown up their hands. They say that scientists have finally figured out how, in spite of the laws of thermodynamics, human beings — the most complex thing we know of in the universe — have come to exist. We don’t. I find it fascinating that a discussion of statistical entropy can ignore the man who founded the field, Ludwig Boltzmann. His headstone says it all, S = k ln W, where S is the entropy, k is the Boltzmann constant = ideal gas constant divided by Avogadro’s number, and W is the number of ways a physical distinguishable system can be assembled from its indistinguishable particles. As far a this article goes in thinking about organisms more advanced that we, this is just so much baloney. We are nowhere near travel in galactic terms – in fact, if you believe Einstein, we can never be. Travel to galaxies hundreds or millions of light years distant? Why would any species ever want to do that, embark on a millions of years journey? Their own species and/or planet would likely be extinct before they could return, even at the speed of light. Secondly, homo sapiens is, even at it’s present evolutionary level, almost certainly a self-extinguishing species. We already have the means, several tens of thousands of nuclear weapons. And all those weapons will someday soon be used. We have never, ever, since caveman threw the first rock, failed to use new and better weapons on a massive scale. Generally a very good article, but applying ideas or arguments borrowed from one field to a very different one is a minefield. That’s why most responsible physical scientists try to be very careful–or don’t venture anywhere evolution or economics. For example what you say about natural selection is true enough, but “reproductive fitness” is not a physical characteristic that can be measured (like mass or temperature), and has very little to do with physical entropy or the second law. The answer to the paradox about evolution being incompatible with the second law of thermodynamics is actually just that one has to consider the whole system of organism + environment. The second law does not prevent subsystems from reducing their entropy — provided that they do so at the expense of increasing the entropy of the environment even more. Thus organized life can spring from non-living matter by natural spontaneous physical/chemical processes because these processes of growth, digestion, reproduction, etc. generate heat, which is dispersed to the ocean or the atmosphere, finally to be radiated away to space–where there is a practically infinite volume to fill. Much more complex processes of biological organisms (like painting the Sistine Chapel or building the Empire State Building or an entire industrial economy) are consistent with the second law of thermodynamics for exactly the same reason–all these activities, however complex and seemingly far from random, generate heat which is radiated away to space. Deny Michelangelo any food, he dies, generates no heat and the painting of the Sistine Chapel cannot happen. The heat generated by any human activity–even sitting quietly in your room, not to mention industrial production–generates far more heat and entropy than what is lost by the increased order of the products produced. The profound question remains of why the universe started in a state of low entropy in the first place, making such entropy producing processes likely. Had the universe from the start been in the probable state of thermodynamic equilibrium it would be very boring, and certainly we would not be here, since nothing at all would happen–except for those extremely rare fluctuations you mention. Maybe the universe itself is just such a fluctuation? I enjoyed the article. I remember how eye-opening my thermodynamics class was in college. The concept of entropy had a deep effect on my understanding of how the world works. The idea that much of what we know about the physical nature of the world is based on the secondary effects of probability and statistics applied to more basic principles, e.g. forces acting on masses and the movement of charges in conductors. As for your initial disappointment that your physics didn’t address issues of change and evolution in a broad sense, it is, after all, called the second law of thermodynamics, i.e. the movement of heat. I came to learn that it meant something broader than that, the movement of energy. Applying it in other contexts is metaphorical, not literal. I just commented outside of Tom Clark’s thread, and after reading his, I see that he had already made essentially the same argument as I did. So I agree with Mr. Clark, and sorry for the duplication below. Extremely convoluted explanation of a simple probability phenomenon. If a deck of 52 cards is thrown in the air, then each is turned over on the floor and stacked back into a deck, the probability of a royal straight flush being stacked is vanishingly probable. But the order which did occur is even less probable (there being 4 kinds of Royal Straight Flushes). The only difference is RSF’s are desirable. Possible big money! Trash hands (in aggregate very probable), money losers. It’s a question simply of what’s desirable. Have an air bladder, it’s vanishingly probable the N2, O2, Ar and trace gases will spontaneously separate but not impossible (though you’d likely have to wait orders of magnitude of the cosomos(es?) age to see it happen). You shouldn’t ask an economist if Muse are right, you should ask a physicist. Economists have never come to terms with thermodynamics. Eventually the universe will end. Therefore, everything in regards to the evolution creation issue is a moot point. In fact, everything including science itself is meaningless–because when the universe ends there will no one to preserve the knowledge of mankind accumulated. Isn’t it nice to know your life is meaningless? The law works spectacularly well on a macro(ish) scale – but one doesn’t have to look very far to find glaring local exceptions. Gravity organises things rather than disorders. Ditto DNA. Such annoying oddities are usually explained by saying something along the lines of, ‘Yes, but given enough time, using the whole universe as a container, things will eventually become disordered’ Which makes sense (if the universe continues to expand and cool). Unfortunately that brings up discussions about what time is. With some saying that ‘Time flows in the direction of disorder’. Oooops, circular arguments all round. Of course, if the universe were to reach a bounce-point and start contracting (The Big Crunch) then the law would fail anyway. If you start with the Big Bang, you have our universe at (or at least nearly at) the highest possible state of entropy. A gas of near uniform composition, density, and temperature. Today we observe our universe at a far lower state of entropy. At least plasmas, gasses, liquids, solids, of over 100 elements in a variety of isotopes and ionization states, un-combined and combined in an ever-increasing variety, in ever increasingly complex interrelations. At temperatures increasingly variable—from the super hot of super nova explosions to the near absolute zero of inter-galactic space. And densities as various as the center of neutron stars and black holes to the vacuum of inter-galactic space. How is this possible if the second law is true? Because the second law isn’t the only law. Gravity and thermonuclear reactions (and perhaps much else) also play their roles. If you do not start with a belief in the Big Bang, you may think otherwise. Interesting and entertaining read. Unfortunately, the author propagates a very widespread error, arguing that because the 2nd law can be explained based on probability theory, that anything explainable by probability theory must be the 2nd law. Nope. The 2nd law of thermodynamics deals with – what? Thermodynamics. It deals only with heat and work, along with internal energy, hence the arguments based on microscopic states. Anything else – economics, genetics, etc. – is just analogy, with no physical basis. The analogy may or may not hold. The 2nd law is wrong. Waste heat entropy is reduced every time liquid water evaporates.